Chronic medical conditions can be difficult to manage for you and your loved ones. You do not have to struggle alone. Beacon Care Coordination will help you manage and learn more about your condition with compassion and convenience. Coordination of care involves a team effort to provide the highest quality of well-being services. The Beacon Care Coordination Team will collaborate between healthcare teams, providers, families and patients to reach optimal health and wellness. Provides support for chronic healthcare needs. Helps achieve goals to improve outcomes and quality of life. Assists in helping to attend appointments with primary care provider and/or specialist. We realize that you may have questions and concerns. Our nurses will visit with you when you are in the hospital, assure you are ready to leave the hospital, and work with your primary care provider or specialist to develop a plan of care specific to your health needs. Provide education on signs and symptoms to be monitored. Prepare you with coping skills to better live with your chronic illness. Follow up with you after a hospital stay. Establish resources to help you with lifestyle changes. Promote optimal health and independence. A registered nurse is available to meet with you in your home or wherever you are most comfortable to discuss your health conditions and concerns, provide education and answer any questions you may have. A home visit may include support for preventative screenings, help with monitoring appointments and assist you with all stages of your chronic condition. A home visit can help provide education, assistance, goal setting and goal achievement. Telephone and skype options are also available. We realize it’s necessary to help address social needs that may affect your health care. Our goal is to help you eliminate any barriers to care, and address basic living needs so you can focus on management of your condition. Who could benefit most from this program? 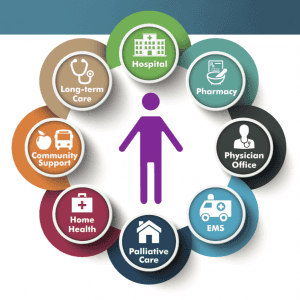 Social or economic conditions/disparities that impact the effectiveness of managing care. Multiple hospital stays due to worsening or uncontrolled chronic condition. For additional information about Care Coordination or to request a referral, please speak with your physician.